Some GPS systems may incorrectly direct you to the wrong end of the horseshoe shaped Schiber Court. If entering from the East end of the horseshoe, just continue around the loop and you will find K-10's on the right. If entering from the West end of the horseshoe, K-10's is on the left about a hundred yards from Vadalabene Drive. Look for the blue and white metal building. If you live outside the St. Louis Metro area, use the Google direction find under the map. Simply type your address in the box and click the Directions button. From St. Louis - East on I-55/70 from the Poplar St. Bridge to exit 15B, Route 159 north to Vadalabene Dr. (fourth traffic light just past Ameren IP), right on Vadalabene Dr., 400 yards, turn right on Schiber Ct. (just past the second medical building), 19 Schiber Ct. is the third building on the left. The blue and white building south of the gray mini-storage. From Belleville - North on 159 to Vadalabene Dr. and proceed as above. From St Charles - I-270 (to Chicago) east to exit 12, Route 159 south to Vadalabene Drive (third light), turn left on Vadalabene Dr. and proceed as above. From Edwardsville - South on Route 159 to Vadalabene Dr., turn left and proceed as above. 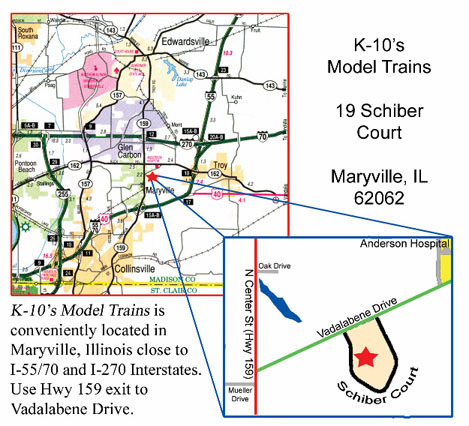 From The East - I-70 west or I-55 south to exit 18, Troy, west on Route 162 to Vadalabene Dr. (just before large brick hospital), left on Vadalaben Dr., a half mile to Schiber Ct. which is a U-shaped road with two entrances on Vadalabene. Turn left at the second entrance just past the first three medical buildings and prior to the last two medical buildings. 19 Schiber Ct. is the third building (blue and white) next to and south of the gray mini-storage buildings. From Highland - West on route 40 to I-55/70, north on I-55/70 to exit 18 (next exit), route 162 west (left), proceed as above in the approach from "The East". From The Southeast - West on I-64, north on I-255, east on I-55/70 to exit 15B (2nd exit), proceed as above from "St Louis".